Humans have a multitude of senses. Sight (vision), hearing (audition), taste (gustation), smell (olfaction), and touch (somatosensation) are the five traditionally recognized senses. The ability to detect other stimuli beyond those governed by these most broadly recognized senses also exists, and these sensory modalities include temperature (thermoception), kinesthetic sense (proprioception), pain (nociception), balance (equilibrioception), vibration (mechanoreception), and various internal stimuli (e.g. the different chemoreceptors for detecting salt and carbon dioxide concentrations in the blood). However, what constitutes a sense is a matter of some debate, leading to difficulties in defining what exactly a distinct sense is, and where the borders between responses to related stimuli lay. Extrasensory perception (ESP), is commonly called the sixth sense and includes reception of information not gained through the recognized physical senses but sensed with the mind. The term was adopted by Duke University psychologist J. B. Rhine to denote psychic abilities such as telepathy, psychometry, clairaudience, and clairvoyance, and their trans-temporal operation as precognition or retrocognition. Our noses may be able to adapt themselves to tell the brain, as efficiently as possible, about the most typical smells in our environment. The ability to distinguish between self and others is extremely important. During the first period of life, newborn children develop somatosensory awareness of their bodies mainly through being touched by those who care for them. Problems with the self-concept, such as the ability to recognize one's own actions, are common in several psychiatric disorders. Most people cannot tickle themselves, but some patients with schizophrenia can, suggesting that their brain interprets sensory perceptions from their own body differently. The human nose can distinguish one trillion different scents -- an extraordinary feat that requires 10 million specialized nerve cells, or neurons, in the nose, and a family of more than 400 dedicated genes. But precisely how these genes and neurons work in concert to pick out a particular scent has long puzzled scientists. This is in large part because the gene activity inside each neuron -- where each of these 10 million neurons only chooses to activate one of these hundreds of dedicated genes -- seemed far too simple to account for the sheer number of scents that the nose must parse. Smell and behavior: The scents of taking action In all animals, including humans, smell - the oldest of the five senses - plays a predominant role in many behaviors essential for survival and reproduction. It has been known since ancient times that animals react to odors. In a new study scientists at show that an inhibitory circuit that releases the neurotransmitter GABA into the olfactory bulb strongly modulates behavioral responses to odors in lampreys. The study of these modulatory mechanisms allowed the researchers to discover a new pathway linking together olfactory and motor centers in the brain. This discovery demonstrates that odor scan activate locomotor centers via two distinct brain pathways. Humans constantly experience an ever-changing stream of subjective feelings that is only interrupted during sleep and deep unconsciousness. Finnish researches show how the subjective feelings map into five major categories: positive emotions, negative emotions, cognitive functions, somatic states, and illnesses. All these feelings were imbued with strong bodily sensations. These results show that conscious feelings stem from bodily feedback. Although consciousness emerges due to brain function and we experience our consciousness to be "housed" in the brain, bodily feedback contributes significantly to a wide variety of subjective feelings. Imagine the foul smell of an ash tray or burning hair. Now imagine if these kinds of smells were present in your life, but without a source. A new study finds that 1 in 15 Americans (or 6.5 percent) over the age of 40 experiences phantom odors. At the same time they also videoed their faces so they could measure their facial expressions to the different odors after the experiment. The researchers replicated the finding that Jahai speakers use special odor words to talk about smells. this is what they found. Researchers for the first time, coaxed human stem cells to become sensory interneurons - the cells that give us our sense of touch. The new protocol could be a step toward stem cell-based therapies to restore sensation in paralyzed people who have lost feeling in parts of their body. Sensory interneurons, a class of neurons in the spinal cord, are responsible for relaying information from throughout the body to the central nervous system, which enables the sense of touch. The lack of a sense of touch greatly affects people who are paralyzed. For example, they often cannot feel the touch of another person, and the inability to feel pain leaves them susceptible to burns from inadvertent contact with a hot surface. Neuroscientists have investigated which brain area is responsible for storing odors as long-term memories. Some odors can trigger memories of experiences from years back. A new study shows that the piriform cortex, a part of the olfactory brain, is involved in the process of saving those memories; the mechanism, however, only works in interaction with other brain areas. 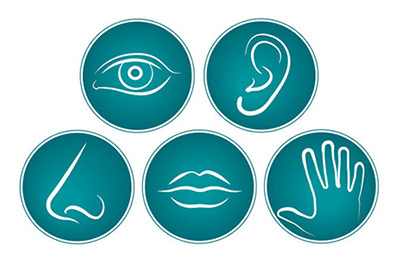 Humans have five basic senses: touch, sight, hearing, smell and taste. The sensing organs associated with each sense send information to the brain to help us understand and perceive the world around us. People also have other senses in addition to the basic five. Here's how they work. Biologists on the Florida campus of The Scripps Research Institute (TSRI) have discovered a new mechanism that likely underlies how we feel force or touch. Their study suggests that "rafts" of fatty lipids on the cell surface act as compartments to keep certain enzymes from mixing with their binding partners. Disrupt these rafts through touch - also called mechanosensation - and the enzymes will mix with their partners and react, triggering a signal that communicates the touch to responsive proteins in the cell.